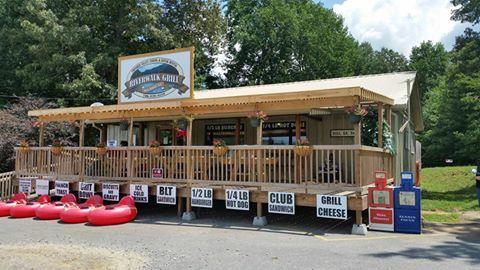 River-walk Grill offers large fresh quantities of food from hamburgers, grill cheese, BLT, clubs and 1/4 lb hot dogs. They also have a pancake that hangs over your plate. The full breakfast includes coffee and is $7.00. Tubing on the Toccoa River is a 4.4 mile thrill and the only true longest water float trip on this River. They also offer three Kayak routes with sit on Kayaks.